2012 was a good year for boxing, there were many big fights and exciting moments, and for 2013 to be a better year for boxing, the best need to fight the best. Below is a list of fights that are unmissable for boxing fans, and would make 2013 a great year. 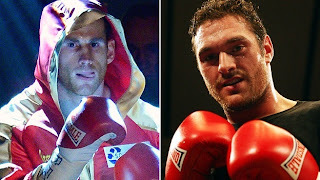 1) Tyson Fury Vs David Price - Easily one of the most talked about match-ups in world boxing. You have two undefeated, promising, prospects, who fought in the amateurs and have a huge fan-base. It is seen as a 50/50 fight by most fight fans, and one that would bring a lot of excitement back into the Heavyweight division. 2) Sergio Martinez Vs Gennady Golovkin - The biggest fight to be made in the Middleweight division. Martinez has established himself as the Middleweight champion of the world, Golovkin is a dangerous, world-class opponent who many fight fans believe has what it takes to beat "Maravilla" Martinez. 3) Scott Quigg Vs Carl Frampton - This is a another huge fight for British boxing. Both Quigg and Frampton are undefeated, and both get better and better after each fight. Team Frampton say they want the fight now, but I agree with Scott Quigg and trainer Joe Gallagher who say this fight should be a "world title fight." 4) Danny Garcia Vs Lucas Matthysse - It would be impossible for this fight to be boring. You have two huge punchers, both can take a good shot and both are reckless defensively. Unlike some of the fights on this list, Garcia/Matthysse is likely to happen. Both are with Golden Boy Promotions and both are the top dogs in the 140 Pound division. Garcia has to get past Zab Judah first. 5) Nonito Donaire Vs Abner Mares/Guillermo Rigondeaux - We would be asking to much to see both of these fights, so if only one of the fights takes place in 2013, I'll be happy. We all know that Donaire is with Top Rank and Mares is with Golden Boy, so we will have to rule out them two fighting each other for now. But Donaire and Rigondeaux have the same promoter, no reason why this fight can't be made in 2013. 6) Amir Khan Vs Kell Brook - The third all British clash on the list. For those of you who have seen Khan and Brook on Ringside together will know that they clearly don't like each other. Both are extremely talented and this could be one of the biggest match-ups in British boxing history. However Kell Brook has an extremely tough assignment on his hands with Devon Alexander. 7) Saul Alvarez Vs Austin Trout - Another fight where the fighters have promoters who can work with each other. If this fight doesn't get made it would be a huge disappointment. Alvarez was in talks to fight Cotto, Cotto got beat fair and square by Trout, the fight makes perfect sense. Let's find out who the best 154 Pounder on the planet is. 8) Carl Froch Vs Mikkel Kessler - This fight will almost definitely happen. According to Eddie Hearn of Matchroom promotions, talks for the fight are going well and we may hear an announcement in the near future. The fight is rumoured to take place in May in England. Enjoy! So that's nine huge fights that as a fan I hope can happen in 2013. Realistically not all of the fights will get made, but let's hope at least five of the fights listed take place in 2013. Have I missed any fights out? What big fight would you like to see take place in 2013? ?